The smudge tool doesn’t sound like a terribly exciting tool, something that you could have some fun with – but it can be and we’re going to look at one way in this tutorial. The first thing that you will need to do is create a new document, I have used 800 × 600 with a black background. Next you will need to create a new layer above the background layer by clicking on the new layer icon at the bottom of the layers palette and then select your elliptical marquee tool and draw out a small circle similar to the one below, holding down the alt + shift keys. Before deselecting the marching ants, go to the gradient tool and pick a gradient from the drop down menu, I’ve used the ‘copper’ gradient. Make sure you are using a linear gradient, and hold down your shift key while dragging from the top to the bottom of the circle – you can deselect the marching ants. You can go ahead and duplicate the small circle by selecting your move tool then holding down the Alt + Ctrl keys (this will copy and drop the copy onto a new layer), drag a little way then hold down your shift key as well and this will constrain the down movement. Next you’re going to grab the pen tool, and, starting from the centre of the top most circle, click a point then move across and click and drag another point. 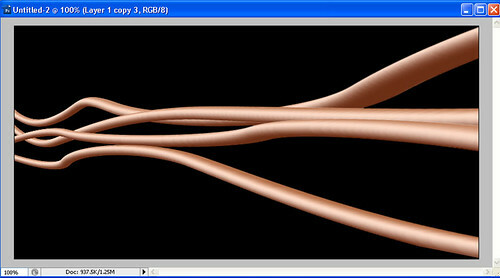 You will have to reduce the size of your image for this, but keep the canvas larger because you will have to click the final part of the path outside of the image. Go to your paths palette, which should be default with your layers and channels palette, if it isn’t go to Window>Paths – and at the bottom on that palette click on the ‘create new path’ icon. Go back to your tools palette and choose your pen tool again, click on the centre of the next circle and do something similar to the above, but change the direction a little. Repeat this for the other 2 remaining circles. The original path will be called ‘work path’ and then the rest will be called ‘1, 2, 3’ – you will need to line up the corresponding layer in the layers palette in one of the future steps, but first we have to go and choose a hard edge tip for the smudge tool. 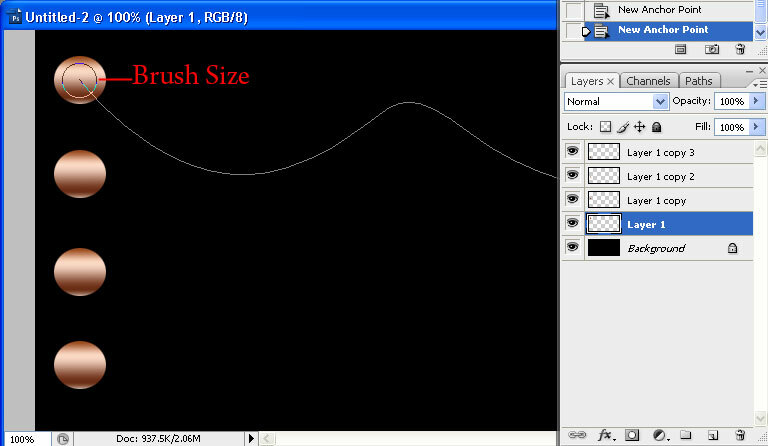 Click on the smudge tool and get a size similar to the one in the image below. I’ve made the circles and brush size bigger than I normally would for the sake of visibility. Depending on what you were going to do with this technique, all things can be changed. 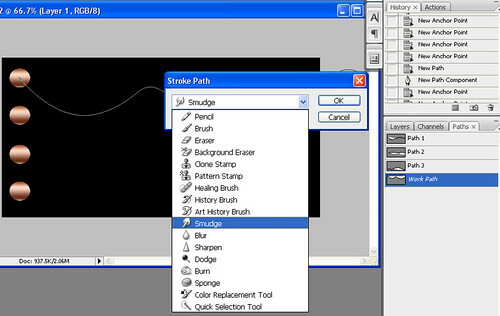 With the smudge tool selected, click on the first layer in the layers palette, then go to the paths palette and click on the ‘work path’ layer, then right click on this choose ‘stroke path’ from the fly out menu – a small dialogue will appear and ‘smudge’ should already be selected, but if it isn’t choose ‘smudge’ from the drop down menu. Click OK and you should have something similar to the next image. You can go to your paths palette now and drag the path you just stroked to the little bin icon at the bottom of the palette. 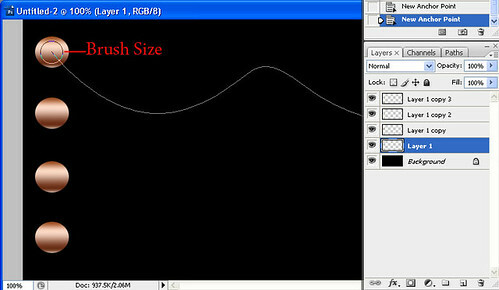 Go to the next layer up the stack in your layers palette, make sure the smudge tool is still selected (it should be), go to your paths palette and click on the corresponding path in there, then at the bottom of the paths palette click on the small ‘stroke path with brush’ icon (second from the left) Continue to do this until the remaining paths are completed. Depending on the gradient you used and the size of the circles and brush size, your image might look something similar to the one below. Go ahead now and merge the 4 stroked layers in your layers palette to 1 layer. Next, press Ctrl + T on your keyboard to bring up the Transform tool, right click inside this and select ‘distort’. You can do something similar to the image below if you like, but I would suggest that you go to Layer>Matting>Defringe after you distort the selection – I used a 10 pixel radius on this particular image. From here you can go ahead and do a multitude of different things. Change the background and experiment with blend modes. 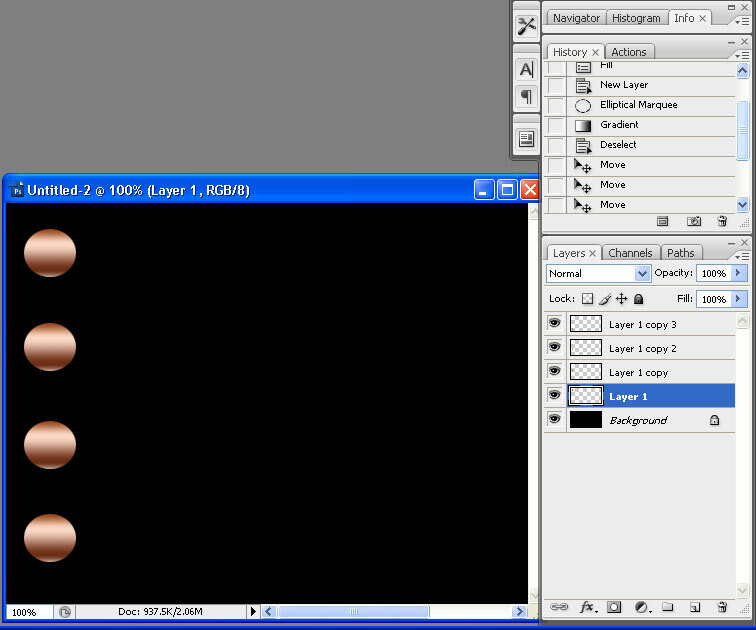 Use the plastic wrap filter, or give the image a drop shadow then place the drop shadow on its own layer and blur it. 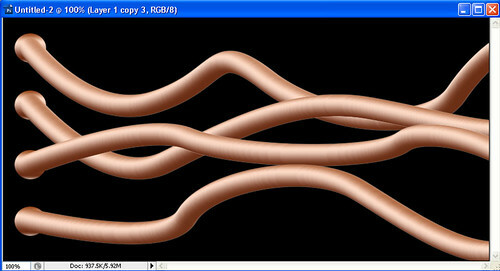 You don’t even have to use 4 of these pipe effects. 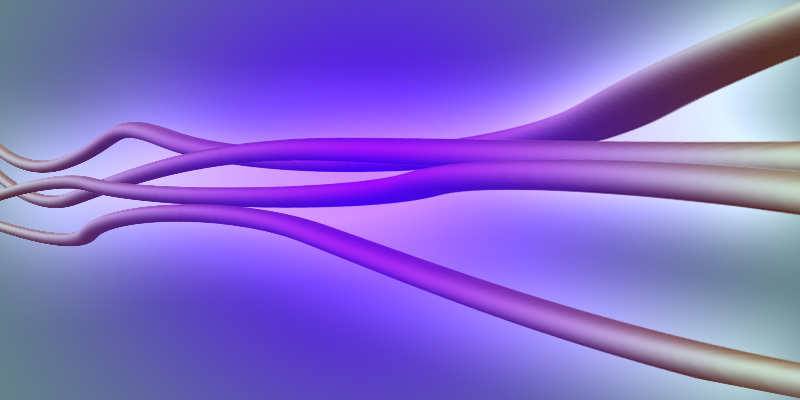 On the image below I changed the b/ground to blue with a radial gradient, and changed the blend mode to overlay. I then used the FX to give the pipes an outer glow by changing the glow colour to white, a blend mode of ’Linear Dodge (Add) with an opacity of 50% Technique set to softer and a spread of 90%. Try out different things and see what you can come up with, but most of all – have fun!